I have been honest with my emotions and open about this journey to virtually everyone I know. I have hoped that by sharing my story and being real with how hard this has been for me, it may help another feel as though they are not alone and more importantly, help others understand the fertility… or in my case, lack of fertility, journey people can experience. So today, I get real with you again. I am scared as it’s not confirmed by my doctor and the blood test will be in a few days. My body feels tired and at times I feel crampy pressure. It’s a very real possibility and I want to be excited, but it’s not the right time for it yet. I have become incredibly sensitive to people asking about the IVF process and when we are going to transfer. (This is prior to people actually knowing that we transferred). A totally legitimate question, but that also means they know when we will find out and then they know when the most vulnerable stage of the pregnancy is, when miscarriage is still a very real possibility and when I am not sure I want just anyone knowing. I’m not ready for everyone to know that we have actually already transferred. The little Maxee is not frozen in Maryland. Maxee is actually inside of me. I feel like a lier as I’m not telling the full truth and the question actually stings. It’s as though I have been walking around in a bikini, being vulnerable and open, and now I just want to wear a sundress and people keep asking to see my bikini. Violated isn’t the right word, but it is interesting how my emotions and sensitivities have shifted. I feel it’s because I am at the most vulnerable stage of this whole process. The embryo is in me and I am waiting in anticipation of what the result will be and the result itself is raw and vulnerable and potentially life-changing. We are nearing the pinnacle point in this whole journey. Are we pregnant? My fear is that we aren’t. It’s not my friends and family’s fault for asking about the transfer date, they have been invited into this journey. This whole process has been so MEDICAL and SCIENTIFIC and I am just wanting to have some sense of NORMALCY when it comes to the allure of pregnancy. To be able to surprise friends and family. To share in the excitement of the good (GREAT) news. What I can offer is that I will let you know as soon as I want you to know what’s going on. I have up until this point, haven’t I? If you know someone going through IVF and they get to this stage when they know how many emby-babies they have frozen, might you consider not asking WHEN they will transfer, but instead mention you understand this is a vulnerable time and are here for when they want to share any further developments. I thought I would be open, but this is something I want to experience with Hubby and be able to share the news when we are ready. My hormones and the extra shots of hormones each morning must really be getting at me. Yes, it’s a little sulky and salty right now and I know it’s my fear. I feel too vulnerable and it’s out of my control if this embryo stays inside me. There is also jealousy for the fact that other people are beyond this unknown stage and able to show the world their baby-bump. These last few days have been quiet, I have enjoyed the slowness of this season, giving my energy to the growth of the hopeful little one. The next time I write, we will know the results of the blood test! This 2WW (two-week wait) is not a joke. I had read about it prior to our transfer and thought to myself, I’ll be ok, I’ve been waiting long enough… I can do 2 more weeks. This seems like a different kind of waiting. (Maybe I’m just making that up in my head or trying to justify it). We returned from the transfer 7 days ago and I have been feeling every single twinge and cramp as though it means something. a) that I’m pregnant or b) that the hormones I’m taking are working. I have had weird cramps, but not really period cramps, over the first few days after the transfer (is that implantation cramping?). I didn’t bleed at all. Dr. O said I probably wouldn’t because of the progesterone oil. Oh yes, those shots continue… every morning. I feel like I have gotten used to the pain and now my bottom just feels sore all the time, like I completed a good squatting and lunge workout yesterday and am feeling the effects. I’ve started warming up the oil by placing it in between my legs in my lap while I do my quiet time in the morning. The nurse said it helps to make the oil body temperature. I also am sitting on the heating pad after. I do have soreness and tenderness in another area, but this could be the hormones too. Unfortunately, there is nothing conclusive except for a pregnancy test that will say for sure. How many days past the FET (frozen embryo transfer) must we wait? Well, we have a blood test scheduled by Dr. O for 2 weeks after the FET (meaning next week), by that point there should be no doubt of pregnancy. 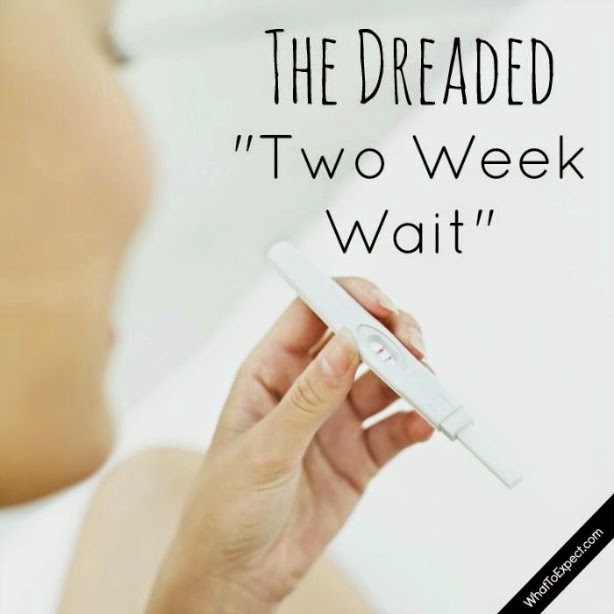 BUT… I have read others taking a home pregnancy test (HPT) as early as 5 days after a day 5 FET. Meaning, our embryo grew in the clinic until day 5 before being frozen, tested, thawed, and transferred, so the thought is little Coffee Bean implanted 36 hours – 2 days after the FET and has been connected to my body ever since. So, we did what I think all people would do, we ordered the HPT that detects early pregnancy and will most likely test in a day or two… wait a few days… tests again… and then have the blood test. I know, I know. We could wait one more week, as the doctor recommended… but she didn’t say NOT to do the HPT. 🙂 Plus, one week seems like such a long time! I actually have gotten used to the unknown space we are in and am choosing to believe that we are pregnant and have been talking to Maxee and praying for Maxee to grow healthy. Either way, we will know soon enough. What are we doing in the meantime? Well, we have google searched FET day 6, day 7, day 8 and pretty much learned about the implantation process and the growth of the placenta. The next phase will be the brain, heart, spinal cord and gastrointestinal tract. SO cool to learn how these things start to form. I am at peace knowing that we either are pregnant and have 9 months of change to look forward to… or we will gear up for round 2 of IVF and begin preparing my body for the next retrieval. I am ready to be pregnant and to bring a little one into this world… my heart is hopeful but protected. Deep breath… calm heart. All is well. Sunday: This morning we left Denver on our 36-hour jaunt to Maryland to pick up Maxee and bring it home. Although we haven’t discussed names, choosing a nickname has been hard! I like the playful spin-off our last name with “Coffee Bean”, but we land on Maxee. On the plane, I sat next to a delightful man from Boulder who is flying to DC for a national science convention when he asked where I was going, I shared about our fertility journey and how excited and hopeful we are for this weekend. I love being able to embrace this story and see the joy and magnificence this brings as the combination of nature, God, and science. Our night is spent celebrating little Maxee (living in the petri dish at Shady Grove clinic) by eating a delicious meal at Wildfire restaurant at Tyson’s Corner. We know it’s not a guarantee this will end with a beautiful baby in our arms, but we are grateful for this opportunity. Tomorrow we get to reunite with our little one. This is the closest we have come to being pregnant, and are enjoying every moment. Monday: 10am: I am receiving my final acupuncture before the transfer. Sitting under the heat lamp, my body is preparing for the transfer. 11:15am: Here I am, sitting on the cream couch, with Property Brothers playing on the flat screen in the background. I am sitting, after just emptying my bladder and refilling it with exactly 16oz of water… Waiting. I get to take my embybaby (Maxee) home today and it gets to be and grow inside of me until it’s ready to come out. My prayer is that in the next 9-10 months I am able to pour every ounce of love, prayer, hope, confidence, and health into this little one. My heart is happy to be sitting here and a little nervous. What will the procedure feel like? How will I feel after? I can’t believe this is as close as we have been to have our own baby! What will it be like to be pregnant? What will the next few weeks mean for me? My stomach is a little crampy but mostly calm. I am 45 minutes away from being semi-pregnant! At what point does one become pregnant? Is it a successful transfer? A successful nesting or implantation? It is it with the results of the pregnancy test in two weeks? I have been praying for a healthy womb, for a clear space to call home. Free of any negative energy and in its place a positive, healthy home that will encourage and support little Maxee. “Hilary Maxwell”… it’s time to go! 12 noon: we are called back to the room. Joining her are 2 nurses. One nurse squirts the ultrasound jelly on my stomach and pushes the monitoring wand on my bladder (yup, cavity full!) and the second nurse asks me to confirm my name, date of birth, and social security number before she confirms the one embryo with me and Dr. O and then leaves the room. Dr. O is a delight and we engage in small talk about what’s about to happen as she inserts the catheter into place (yup, that’s an uncomfortable pinch). Hubby pulls out his phone and begins to film what we see on the large screen tv plastered on the wall. Our second nurse is in the lab next to us and has taken control of the TV screen. Before us, blown up, is the petri dish with a couple of air bubbles and this round thing with a cluster of little circles inside… that’s our Maxee, 5 days ‘old’. 12:26pm: Nurse draws the liquid and embryo into a syringe type and enters into our room. She and Dr. O exchange a specific protocol for transferring the syringe filled with liquid and our embryo. It reminds me of when I used to rock climb and the belayer and climber had to exchange a control check before the climber proceeded to climb. “On belay, belay on, climbing, climb on”. 12:30pm: Maxee is with me! I continue to lay there with a drape over me as Dr. O spends 15 more minutes with us answering our questions and unknowingly validating our decision to work with her. I am scared to use my stomach muscles to sit up and even more scared to stand up, let alone go to the bathroom. What if Maxee falls out of me? I am assured Maxee won’t and begin to dress. Our discharge nurse helps us to know exactly where the progesterone shots are to occur on my backside (we were just a ‘little’ off) and I head for my final acupuncture appointment to help the blood flow before we head to the airport. Dr. O did not prescribe bedrest, just casual walking, and no heavy lifting or intense working out for 2 weeks. We asked about skiing. She was hesitant to answer and her worry is more about if I am hit by someone else on the mountain. Although she said no, she also said it really depends on how crowded the mountain and the likelihood of me getting into a tumble. I don’t know what my answer will be for myself, but for now, the answer is no as I let Maxee get situated. 7:30pm: I can’t believe I am sitting here on the airplane back to Denver, with a little embryo growing inside of me. I know how fast the cells multiplied in those 5 days after fertilization and can only imagine what is happening inside of me right now. Dr. O said implantation can occur in 36 hours and there is no way of truly feeling it happening. She even debunked the thought of implantation bleeding, although might be slight, the bleeding people experience is at times a few days after the implantation. Since I’m on both estrogen and progesterone the likelihood of any bleeding is slim to none, so I know not to be looking for anything as a sign this week. Hubby called me ‘mommy’ for the first time today, I like how that sounds. Although I feel excited by the opportunity and possibility, I am also very aware that this little one may not take and we might not be pregnant. It’s a 70% chance of pregnancy at this point… that still leaves 30%. So I am going to keep things mellow for my body this week, eat warm foods, drink warm water to give Maxee a wonderful environment to enjoy and get a lot of rest. Tonight, we get to bring our Maxee home and pray that it sticks to become a viable pregnancy. We still hold our breath until we have a positive pregnancy test. The 2-week wait (2WW) begins. The start of phase two of IVF has begun. Once we set a transfer date, Dr. O’Brien counted the days leading up to the transfer by going backward. Eighteen days from ending birth control, 17 days from my first ultrasound after all the waiting. Everything looks clear and we are set to go. I begin with Estrace, an estrogen pill, which I will take 3 times a day. Fortunately for me, this same estrogen pill was what I used earlier in my fertility journey as a suppository so I am grateful to be ingesting it this time. I will do this for 11 days and then go in for another ultrasound. The side effects aren’t horrible, and in fact, I can hardly notice a change in my being. Might this be because I am comparing it to the ridiculous amount of hormones I just rid my body of over these past weeks, possibly? It feels good to be on medication that is helping without making me into a witch. The goal is to grow my uterine lining so that it’s nice and ready for little Maxwell Bean to nestle in. My days continue as normal, not thinking too much about the transfer date, which is less than 2 weeks away! I am grateful to not be consumed with thoughts about what the transfer will be like or if it will take. Instead, I am happily practicing living in this moment, as my body prepares a little home. On day 11 of this routine, I go in for what I hope is my final ultrasound before we fly. The lining needs to be at least 8mm thick with no major follicles growing. My doctor didn’t even prescribe me Lupron (an ovulation suppressant drug). My theory is because it took major dosage for me to produce follicles in the first place that she is not concerned about my body deciding to produce follicles now. She is correct, no follicles and my lining is just shy of 8mm, sitting at 7.25mm. The little home is getting ready! Dr O gives the green light to proceed! I am so excited and we move forward to book our car rental and hotel for the night we will be staying in Maryland. Yet, what’s next is not enjoyable. I always imagined IVF to be full of shots in the rear-end, but up until this point, it has been in my abdomen or pills… not bad and not too painful. Starting tomorrow, I (ok Hubby) will shoot 1ml of progesterone oil into the intermuscular area of my buttock every morning precisely at 7:15am. If I falter 10-15 minutes, it could cancel the transfer! Nurse Christine gives me some pointers on how to help this not be as painful. I wasn’t worried about a shot until she began to explain how it’s ok to use a heating pad after and to be sure to switch sides eatery day so as to not completely hurt one side. She explains this is an oil-based liquid so it’s a little thicker so it may burn a tinge. Uh… what is about to happen to me? She also shares it’s best if Hubby administers the shot for a better angle and then jokes, “unless you like to inflict pain on yourself”. Eek! What is this going to be like? She also gives me instructions for the day of transfer. The transfer is set for noon, arrive at the clinic at 11:30 with a photo ID. Be sure to empty my bladder completely at 10:45am and then proceed to drink 16oz of water before 11am. Don’t use the bathroom after 11am. A fuller bladder helps Dr. O position the catheter more precisely as to release the embryo in the correct location. I have my marching orders.